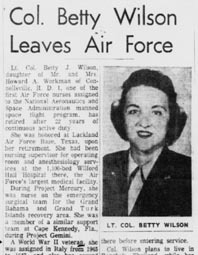 Lt. Col. Betty Jo (Workman) Wilson Canter, daughter of Howard and Phoebe (Thorpe) Workman of Connellsville, Fayette County, PA, was a U.S. Army nurse who served our nation in harm's way during World War II, the Korean War and the Vietnam War. 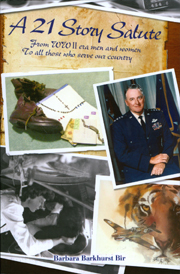 The following memoir, published with her consent, appears in the book A 21 Gun Salute, authored by Barbara Barkhurst Bir, and available for purchase at www.a21storysalute.com. Also see Betty Jo's Minerd.com memoirs of her mother Phoebe (Thorpe) Workman and grandmother, Clara Jane (Freed) Thorpe. 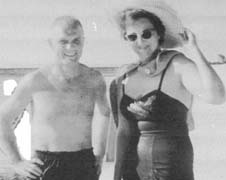 I wanted to go to school to study anthropology -- to be Margaret Mead, Jr. The fact that I was born in 1922, the year King Tut’s tomb was discovered by Howard Carter, fueled my interest in ancient history. This was part of my growing up in Connellsville, Pennsylvania, where I graduated in 1940. 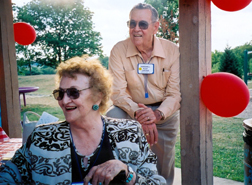 That had interested me -- why the youngest of seven children had Down syndrome. I grow up 40 miles from Pittsburgh, on the main highway between Baltimore and Pittsburgh. I did my nurse’s training in Pittsburgh at Western Pennsylvania Hospital. The war was on so I joined the army when I graduated in 1943. I then went to work at West Penn Hospital and immediately joined the Red Cross as a volunteer as a way of getting into the war. My brother and cousins were already serving. I was trying but couldn’t be released from the hospital, which was short staffed; they had already sent one unit to the Pacific and one to the Atlantic. I worked with the OR team in neurological surgery and continued my studies in psychiatry and public health. We were replacing the Anzio Brach nurses who’d been through the war and experienced some of their colleagues getting killed. They were going home for Christmas. Our nursing mission was still classified "combat" because we were closing the Mediterranean Theater. We first reported to the 300th Naples General Army Hospital Headquarters. Mines were everywhere; our troops were going out on combat on beaches to remove them. We were to close that hospital eventually. Then move north to 61st Station Hospital at Leghorn, Udine and Trieste. I spent over two years in Italy. We waited below in our hospital train. After treating injuries, including only frostbite and one broken leg, we transported them on to Vienna on 28 November. While in Vienna, we were feted by a grateful host, General Snavely, with a Thanksgiving feast at the Bristol Hotel where we were able to stay for a brief rest. Then we returned on our hospital train to 61st Station Hospital in Leghorn. Mrs. Tate wrote about the ordeal in her book Twelve Walked Away. In 1952 three other nurses and I were assigned to a little Air Force station hospital in Dhahran, Saudia Arabia, the only AF hospital out there. I worked in the operating group. The Saudis by now had the largest oil fields in the world; and Aramco (Arabian American Oil Company) was flourishing. Aramco headquarters near Dhahran Air Base was very beautiful. But, back then in the fifties, the Saudi Arabian people still lived very much as a third world country with camels, and so forth. We worked with both the Aramco people and civilians. I mostly had American patients. If any locals came to our hospital they did not have any choice about having a female nurse, but we tried to follow their way of doing things, if possible. The only time I was involved with Arabic women was when we went to take care of several in a harem, to give them shots and such. I got to know, and hang out with the Wilson brothers, John (whom I married in 1956) and Tom, who worked as engineers for Fluor Engineering Corporation to rebuild the Dhahran Air Base. The younger brother, Tom, and his fiancée wanted to get married in Holy Land, but couldn’t go to Israel from Saudi Arabia. At that time there was a sort of a ‘no man’s land’ line that you couldn’t go across. In order to work in that part of the world you had to stay within the Islamic borders -- no trips to Israel, in other words. The brothers were able to arrange, as a tour, a Christian wedding in Bethlehem in Palestine. The only Christian church there was a Greek Orthodox one. The wedding trip included a very expensive tour complete with guides and limos all the way to east Jerusalem and back. I went, too, as I was the made of honor. Our tour guide, who stayed with us all the way, arranged for all four of us to do a form of the hajj. The four of us were raised Christian but were interested in experiencing something outside of the Christian world. We did it in East Jerusalem. We did everything we were supposed to do during a hajj for foreigners. We didn’t do anything that would prevent us from going back to Saudi Arabia within the time limit. I was into archeology and history and enjoyed what I could. I couldn’t go anywhere except with a male accompaniment and a special car. We enjoyed a few getaways to nearby Bahrain Island and Manama, this ancient emirate’s very modern capital. I was fascinated by all of it. I never saw anything so beautiful as the Sahara at night. The moon and the sky covered with endless stars. It’s right there. You could reach up and touch it. I was fascinated. But when the dunes started moving, the wind—we had plenty of wind -- and flies were around you … not so good. The most notable feature of the Western Gulf is the existence of large fields of burial mounds on Bahrain Island and the mainland south of Dhahran. To my frustration, I was never able to explore those archeological sites. My orders never read "air evac," but I did occasionally accompany a patient to a general hospital. One such flight was on a C-47 with gas tank leaking over the Swiss Alps. Once it was from Dhahran to Rome to Paris. We looked out the plane window to see Tripoli on a refuel stopover on an air evac flight to Wiesbaden Hospital taking the son of one of or generals who had gotten burned. We had to stay with patients on the way, but on the way back we had a rest leave just to visit city sights. When I air evaced one of the patients to Wiesbaden I tried to bring back a typewriter but it had the wrong fonts on it -- they were Hebrew not Arabic. This young and handsome Saudi customs agent at the Dhahran airport kept my typewriter. I was tall and redheaded and he started hitting on me, but John Wilson and I were going together by that time. The Saudi wanted me to be his fourth wife. He was in charge of immigration. He kept my typewriter for a long time. Ours was a marriage of distance. Soon after our wedding, he went on a job in Pakistan, while I was assigned to Germany for two years, first at Fürstenfeldburck AFB, Germany, then to Wiesbaden A.F. Hospital. John transferred to Saigon next, and I became part of an OR team at Wilford Hall Hospital at Lackland AFB in San Antonio for two years. The medical team was ready to start pioneering heart surgery on human patients in consultation with Houston Heart Center and Dr. DeBakey. The surgery team was so successful they could turn over the heart surgery mission to the ‘back up’ team. We were a big success and our careers took off like gangbusters. 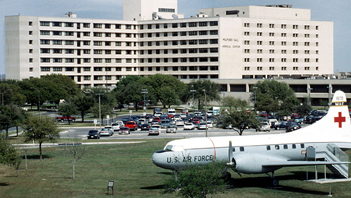 I was then off to Andrews AFB Hospital in D.C., as the operating room supervisor. I couldn’t believe it when NASA notified me at Andrews that I had been selected to be part of the Mercury medical team. It was all very, top secret and I was very excited. The Russians were ahead and President Kennedy gave our program real priority. The team was an integral part of the book and movie The Right Stuff. Lots of flying. TDY trips to Cape Canaveral, Patrick AFB, Grand Turk and Grand Bahama Islands. John and my stepsons commuted to D.C. and the Cape to participate in the experiment. John’s construction business was going well in California. The only time I was with the chimps was when they came back after their space trip. 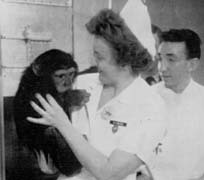 They’d bring the chimp down to the little hospital on Bahama and on Grand Turk Island. That little chimp Ham was friendly. He had just come back from space and, you know, socked with all those things he was supposed to do and I was the only one in nurse’s uniform, the rest of them were doctors and everybody hanging around in their scrubs and the press was there. And they wanted me to hold Ham. I wasn’t sure I wanted to because I didn’t know if he was angry or what. He seemed nice. I took him and he put his arms around me like a little baby. And they took the picture and we were friends from then on. I was with him on the airplane when they brought him back from the Grand Bahamas to Cape Kennedy to the hospital there and then they took him back to Holloman in New Mexico. I didn’t go to Holloman with them. I was with the medical surgical team assigned to Grand Turk Island near the sea recovery area where John Glenn was taken after the flight. When I retired from the NASA assignment on 30 June 1967 and from the Air Force, the program was on hold, having completed the Mercury, Gemini and the early Apollo flights. My two stepsons were in the Marines and the Navy in Vietnam. My husband was a civilian working there: I was on active duty here in San Antonio at Wilford Hall. I flew back and forth from active duty to family leave. 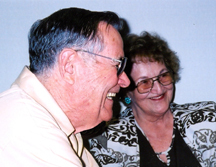 The minute I retired, I went immediately to Vietnam as a dependent wife of a civilian and as a retired lieutenant colonel who had permission to be out there. The Army and the AF knew I was coming, and going to be living with my husband in the coastal city Qui Nhan, supposedly a safer place than Saigon. 29 JAN 1968 2200 hours Notified. Village crawling with Viet Cong. Lock yourselves in securely. You are on your own. 30 JAN 2400 Two hours of dead silence [Tet Begins!] All hell broke out -- fireworks and guns. 0600 John packed up to go to Army base office. Two PA&E [Pacific Architects & Engineers] men killed on way to work in jeep. No one can get to the bodies. Leave them on street for 2 days. 0800 John & colleague came in jeep to evacuate me to PA&E office on Army base—little security on base. Can see Viet Cong on far edge of Army base! Coming in! 1000 Korean Tiger troops in helicopter -- we are saved!! 1200 Army hosp mess for lunch. Nurses in fatigues with pistols strapped to gun belts and wearing helmets. 1300 Two PA&E men try to pick up mail. Hit the dirt! 1400 Sweep the city (Korean Tigers). 1600 Home in open jeep with Dr. John Fox. Go as fast as possible. 0200 Viet Cong now hiding out in buildings all over city. John stays at office—duty. I’m worried the apartment has been ransacked. No, all ok! Electricity off. VC in control of that part of town. 1800 John and Dr. John Fox home safely. Up to the roof garden to see what big guns are about? Guns in helicopters, shelling hill on west side. 2000 Everyone on their roof tops. Don’t know if friend or enemy but no sniping. Pictures. Darkness. Flares and some shooting. Generally quiet. No guard at PA&E area of army headquarters. John out in darkness to next door to Dr. Fox—consults security officer. May have to guard himself if goes to office. 2315 Could hear copter going over with loud speaker saying Lock yourselves in. Anyone on the street will be shot. Wed 31 JAN 68 0700 Up when daylight. Still no electricity except our own little generator. Chi (housekeeper and cook) unable to get to work. John breakfasts and off to office. Left the pistol with me. Watched him safely down the end of street in security jeep. Will he be back? I pack small bag for evacuation. My job to clean up refrigerator and cook meats melting in freezer. Try to save as much as possible. Made BIG meat stew. 1200 Chi gets through or around Viet Cong lines to check my safety. 2000 Night full of flares & gun fire which we can watch. Not known if escaping VC or badly needed replacements. VC hit ammunition dump. 50 people killed. Saigon hit today -- radio silence. Thurs 1 FEB 1968 0500 Heavy gunfire all around. No sleep. John home. All civilians on administrative leave. 1500 Soldiers called out across the way. Korean women next door evacuated to ROK Valley. 1600 Shooting all around us. 1700 We think we are surrounded. No communication to determine what is happening. 2 FEB Peter (our Vietnamese landlord) Viet police, search our house for VC soldiers. John & Jim off to work. General Westmoreland’s statement to press: communications are open again but 3 VC captured just outside our house. 5 FEB All quiet. Momma San opened main iron gate to our building to sweep troops. Now they can’t close. Hope they get it fixed -- our main protection! I planned to stay in Vietnam but a few weeks later the Korean Secret Service found out I was on the Viet Cong prisoner pick-up list. (They probably wanted me to get in one of those tunnels as a nurse. I was too tall to live in one of those tunnels.) I was immediately air evacuated to Clark Field AFB in the Philippines and went back to California. My husband John stayed until June. John Jr. rotated home but Garth, 19, was still in Mekong Delta with the Marines. We were sure he would never get home safely. We all recovered from our ‘battle fatigue’, John and I went back -- this time to Saigon and then onto Bangkok to live where all the other company spouses had been living all along. I became a volunteer docent in the Bangkok museum, fitting for someone who loves ancient history. My distance marriage would eventually end after we returned to California. I returned to San Antonio where I worked, this time as a civilian, as an operating room nurse supervisor at Methodist Hospital from 1971 to ’73. Finally, in 1987 I moved into the newly completed Air Force Village II. A long ago friend and soul mate, Marshall Canter, came back into my life. We recently celebrated our 16th anniversary. Copyright Betty Jo (Workman) Wilson Canter. Republished with permission.